Eye Movement Desensitization and Reprocessing (EMDR) therapy is an integrative psychotherapy approach that has been extensively researched and proven effective for the treatment of trauma. EMDR seems to have a direct effect on the way that the brain processes information. Neuroimaging after EMDR has shown increased activity in the pre-frontal cortex (the learning/thinking brain) and inhibition of the over-stimulated limbic/emotional system. One of the main components of EMDR Therapy is the use of Dual Attention Stimulation (DAS). DAS can be done with alternating stimulation using eye movements (EM), tactile pulsers held in the hands, audible sounds in each ear or by hand taps on the right and left side of the body. The eye movements we use in EMDR seem to unlock the nervous system and allow your brain to process the experience. That may be what is happening in REM, or dream, sleep: The eye movements may be involved in processing the unconscious material. The important thing to remember is that it is your own brain that will be doing the healing and that you are the one in control. When you cut your hand, your body works to close the wound. If a foreign object or repeated injury irritates the wound, it festers and causes pain. Once the block is removed, healing resumes. 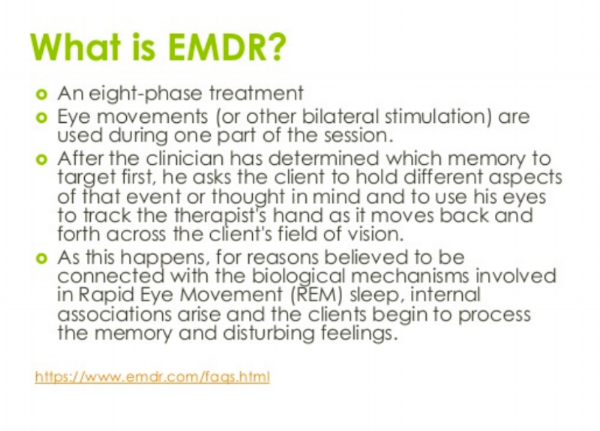 EMDR therapy demonstrates that a similar sequence of events occurs with mental processes. The brain’s information processing system naturally moves toward mental health. If the system is blocked or imbalanced by the impact of a disturbing event, the emotional wound festers and can cause intense suffering. Once the block is removed, healing resumes. Therefore, EMDR can be thought of as a physiologically based therapy that helps a person see disturbing material in a new and less distressing way. For most clients, successful EMDR treatment results in the new, positive, cognition generalizing throughout the entire neural network. For a more in-depth description of the neurobiological processes involved with trauma and EMDR, please visit http://www.emdria.org/. More than 30 positive controlled outcome studies have been done on EMDR therapy. For more on research and acceptance, click here.